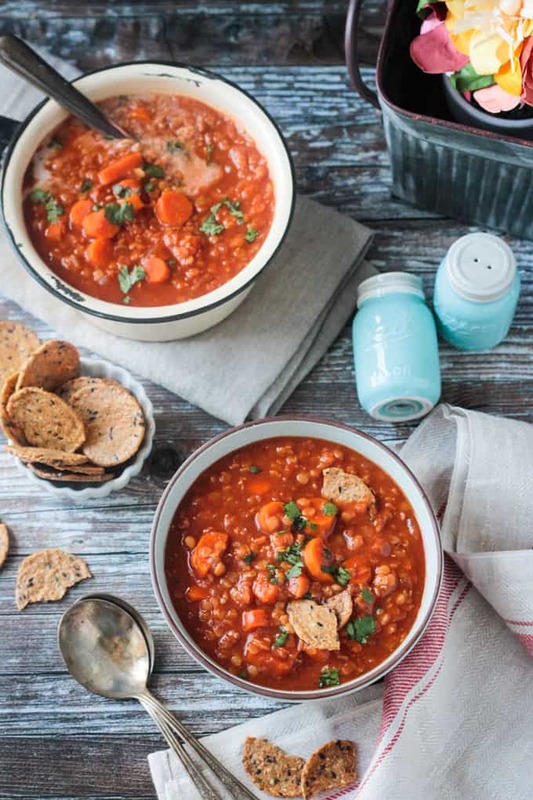 Hungarian Red Lentil Soup – from the new cookbook, The Vegan 8. Quick and easy, full of flavor, and totally comforting. Get the recipe, full review of the cookbook, AND a chance to win your very own copy below! Quick and easy recipes with just 8 ingredients or less that are as delicious as they are healthy. From breakfast to dessert and all the snacks in between, you’re sure to feel satisfied with this accessible plant based comfort food. 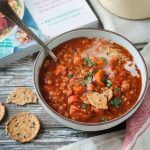 Keep reading for the recipe for Hungarian Red Lentil Soup, a full review of The Vegan 8 cookbook, and a giveaway! Brandi Doming is the author of The Vegan 8 blog and cookbook. On her blog, Brandi shares vegan recipes that are all 8 ingredients or less, not including salt, pepper, and water. This new cookbook follows suit. 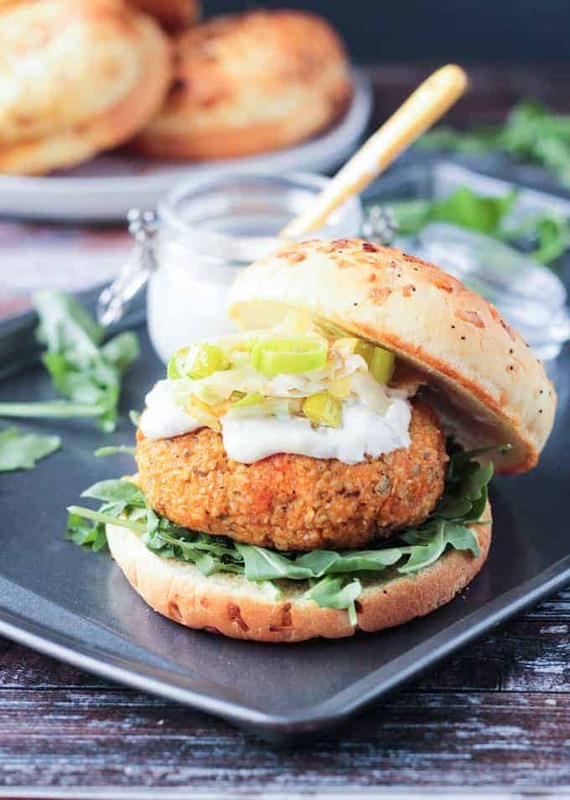 Simple and delicious plant based recipes that everyone will love, from lifetime vegans to omnivores and everyone in between. You’ll find recipes for breakfast, quick lunches, simple dinners, snack time, dips and sauces, and sweet desserts. Brandi also includes a chapter of Pantry Staples and Kitchen Equipment – stock your kitchen like hers and you’ll have the best kitchen on the block! You won’t believe all the flavor that’s packed into this incredibly quick and easy soup! I reheated leftovers with a big handful of baby spinach – so good! 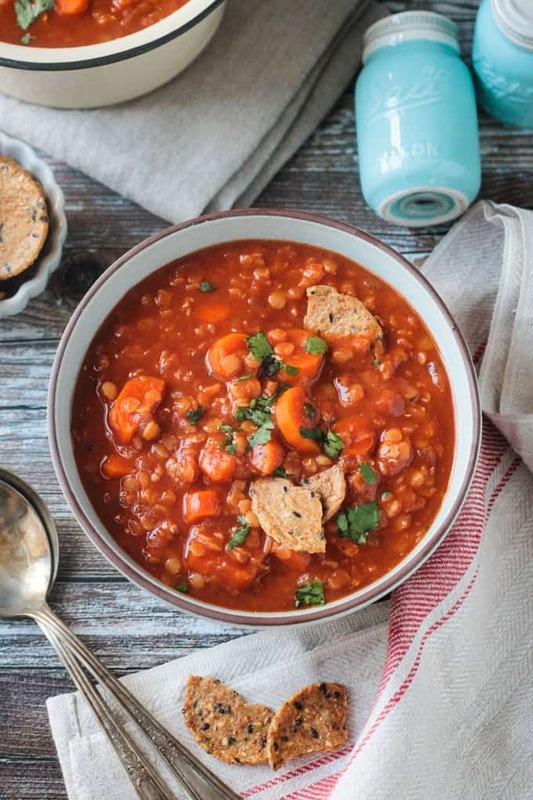 I hope you love this Hungarian Red Lentil Soup recipe as much as we do! 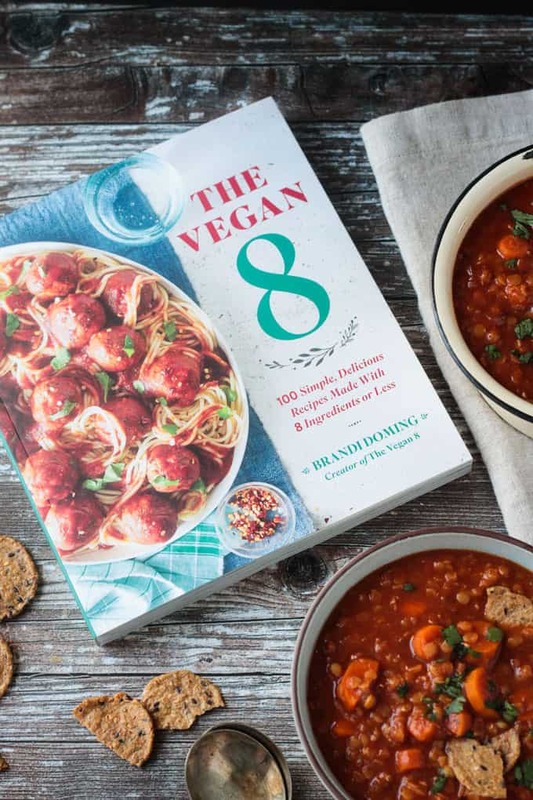 And don’t forget to enter the giveaway below for your chance to win a copy of The Vegan 8. If you just can’t wait to see if you’re a winner and want to ensure yourself a copy, you can order it here. Dinner doesn't have to take forever. This recipe comes together fast, thanks to red lentils and easy ingredients. The Hungarian paprika, dry mustard, and tomato paste give this simple dish a wonderful depth of flavor. 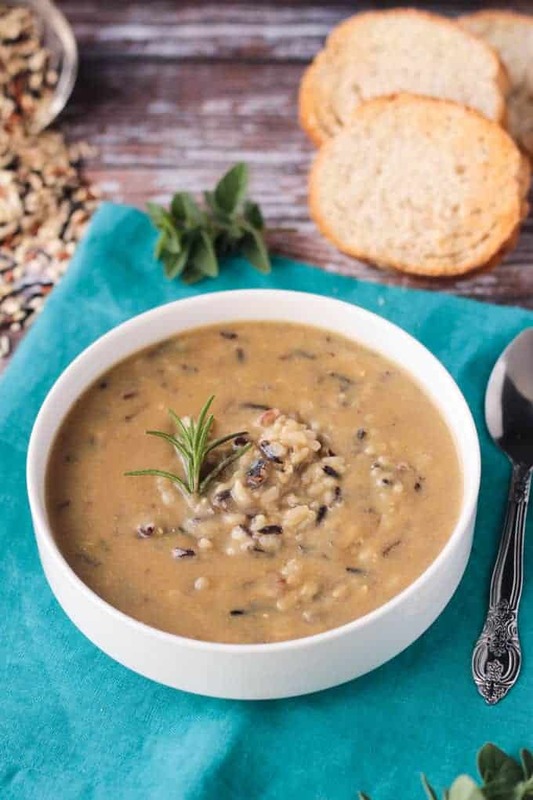 This soup goes great with some fresh crusty bread! Add the onion, carrots, garlic, and 1 cup (240g) water to a medium pot over medium heat. Bring to a simmer and cook for 8 minutes, stirring a couple of times during, or until the veggies are tender but not overly so. Remove the pan from the heat and add the lentils, 2 1/2 cups (600g) water, tomato paste, paprika, dry mustard, salt and pepper. Stir well and bring to a boil over high heat. Cover, reduce the heat to low, and simmer for 10 minutes. Add the milk and increase the heat to medium-low; cook 5 to 10 minutes or until the lentils are tender yet still firm and the soup thickens some. Stir often and do not overcook, as you don't want the lentils to become mushy. Taste and add more salt, if desired. Serve immediately. ~Make sure the paprika you are using is not hot paprika. ~For the milk, it is important to use a creamy milk like cashew or "lite" coconut milk here for best results. The "lite" coconut milk is very creamy but yields no coconut taste. Almond and rice milks don't do well, and definitely don't use full-fat coconut milk as it is too rich and thick and will ruin the flavor. Made this tonight. Simply delicious!!! Thank you! So glad you loved it, Cathy! Oh no! Sorry to hear about your car. This book will definitely help you! I agree! Gotta wow those doubters! Good luck, Janice! I think that this book would help me with my type 2 Diabetes. I live out in the boon docks with a small town that does not have much variety at the one grocery store in town. You’ll love this book, Diana. Good luck! Would love to win this cookbook! Two vegan daughters and I’m always looking for new recipes! This book would be perfect for you! Me too! Good luck, Paula! Would love to win this cookbook as I’m always interested in new ideas/ recipes for easy vegan meals! Ooh, I know what I’m making tomorrow for lunch. It is snowing hard here and I have all the ingredients. Perfect. I’d like to win the cookbook so I would have that meatball recipe- I probably have all the ingredients for it.haha. 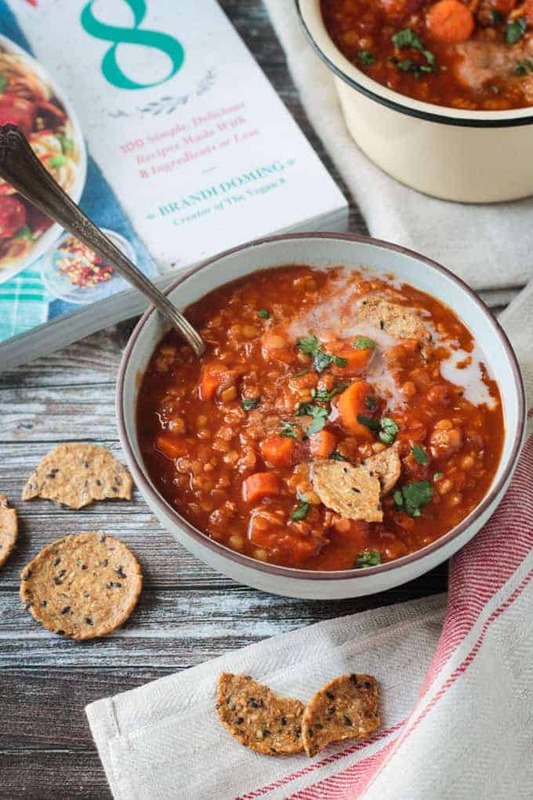 This soup would be perfect for a cozy snow day! You are so welcome! Your book is going to be a HUGE hit! I’d love to win a copy of this cookbook because I love the idea of plant based recipes that don’t require tons of ingredients. I’m a fan of the blog and have already tried a few recipes there. Flipping through a book would be so easy, too! I’m with you! Quick and easy is the name of the game. Good luck! I would love to win because this recipe looks delicious! It definitely is! Good luck, Alana! i would love to win the cookbook because i need some good standard vegan recipes to rely on since i’m in an area with few vegan options readily available to me. Plus how could someone not want a vegan cookbook that includes awesome sounding desserts. Right?! You’ll love it, Jacquie! The soup looks amazing! Love everything Brandi makes in her awesome cookbook! I haven’t met a recipe of hers I haven’t loved! Thanks, Lana! I am a new vegetarian who is trying to become vegan like my daughter. It would help me and her to have the cookbook to help with recipes. Wonderful! I love when families come together to support each other. Good luck! I do not need a cookbook as I can find all of your awesome recipes online and then some! I think your site is fantastic and really love your recipes! They are so easy to follow and always so freaking good! I love being plant based and am grateful for your site. Recently I made (twice now!) the date nut bread which was just to die for. Oh, thank you so much, Chris! You just made my day!! And that date bread was inspiration from my mother-in-law’s recipe that she makes every Christmas. It’s a favorite for sure! I would love to win a copy of The Vegan 8 cookbook because… dealing with food allergies and living the choice to be Vegan in the Midwest means I cook most of our meals, snacks, desserts, etc. from scratch. Sometimes I can stuck in a rut, be low on choices in the pantry, or have “meal imagination fatigue” ! 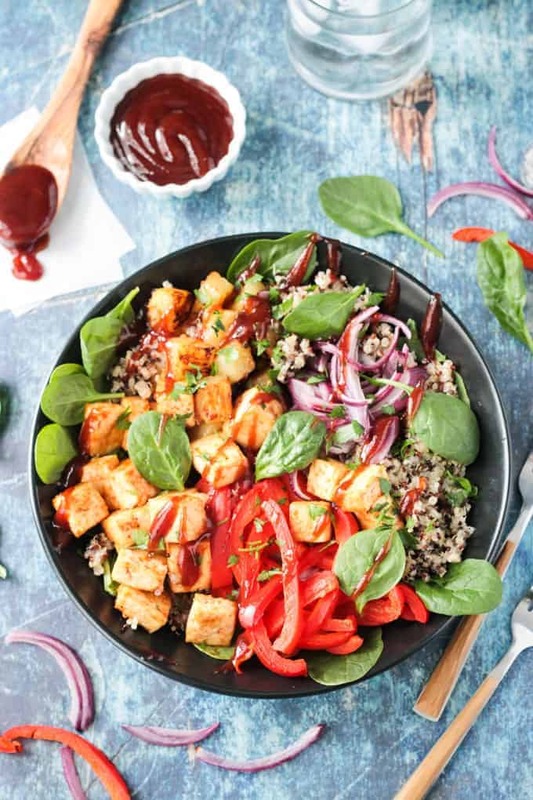 Vegan recipes that use fewer ingredients and can be quick to put together help make meals, especially on week nights, healthier and less stressful! I totally understand all of this. Although, we don’t deal with allergies, we live in the Midwest too. It’s slim pickings around here if we want to eat out. I would love to win a cookbook to increase my plant based recipe collection! Sounds like a great idea to me! Good luck! I would love to win the cookbook because at 59 I am trying to learn all I can about transitioning to a plant based diet and need all the help I can get! That’s great, Teri! Let me know what you need help with specifically, if anything. Feel free to e-mail me anytime too. Good luck! IT’S GREAT THAT YOU HOST OTHER VEGAN COOKS AND SHARE RECIPES. THANKS! You are so welcome! I love sharing delicious plant based food! We all have to stick together, right?! This book would be great for you! Thanks, Alayna! I would love to win because I have recently started eating more plant based meals and my digestion has been worlds better! That’s great to hear, Samantha! Good luck! Oh no!! I’m so sorry to hear that, Marsha. So sad. Good luck!